Home / Breeders' Cup / Breeders’ Cup 2018 Recap – Longshots, Highlights & Cashes! Breeders’ Cup #35 is now a wrap, and Churchill Downs proved to be a worthy venue, once again, just missing the deluge that fell 24 hours prior to the first Breeders’ Cup race. It was truly a day of champions and horses to follow for next year. What struck me most about this year’s Breeders’ Cup was just how chalky it came up in the win spot. Of the 14 races, an astonishing 12 races (86%!) were won by the 1st or 2nd favorite (5-1). Not what you are hoping for when it comes to the Breeders’ Cup races from a wagering perspective. Perhaps the most valuable feature of the Super Screener is the great track record produced over the years in isolating from the many long shots in these Breeders’ Cup races, those that have the best shot to hit the Superfecta. This year was no exception, and the Super Screener delivered once again on that front. 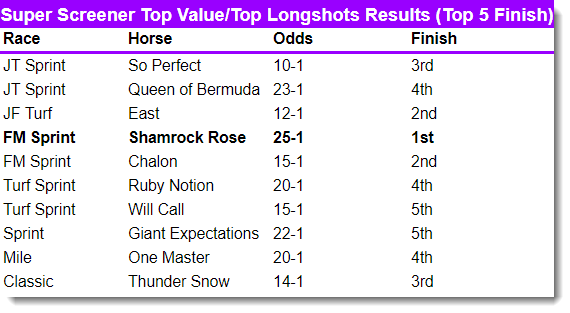 Below is a chart that captures the outcomes of horses we designated as Top Value/Top Long Shot that finished in the top 5 and went off at 10-1 or higher. The highlight of the weekend was the fact that the Super Screener isolated as a Top Long Shot pick the only double-digit-odds horse that won over the 14 races. That came in the Filly and Mare Sprint, when Shamrock Rose stormed home from post 14 to shock at odds of 25-1! She met the long shot criteria for this race to a “t” and delivered big time! What can we learn from the 20-1+ shot bombers that hit the Superfecta? We’ll be digging in deep to address that question in the following weeks, analyzing the following long shot bombers that hit the Superfecta to calibrate the Super Screener screening criteria for each race. The following chart captures all the 20-1+ horses that finished in the Superfecta over the 14 races. We have included the track at which they submitted their final prep, their running style in the Breeders’ Cup race and their finish. What are some of the quick conclusions we can draw from this table? Nearly 80% of the long shot bombers were closers and, to a lesser extent, off the pace types. There were no long shot bomber pace types that hit the Superfecta in any race. 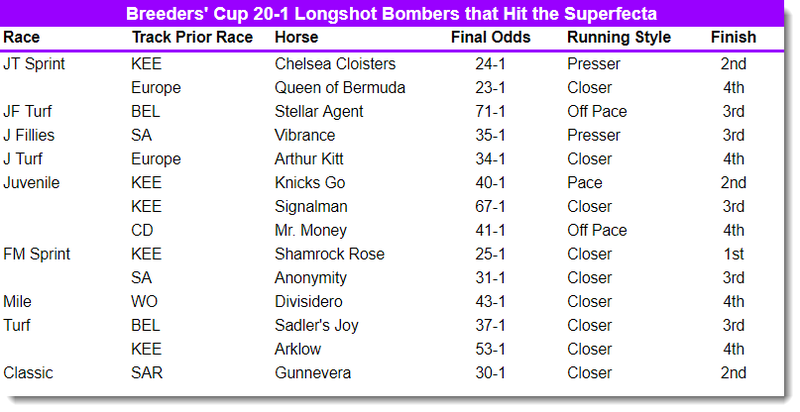 10 of the 14 long shot bombers (71%) finished 3rd or 4th. 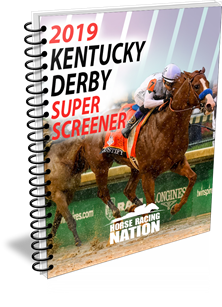 While the primary purpose of the Super Screener is to provide detailed race and horse-by-horse analysis, isolating the top long shots and favorites to fade, we also offer suggested wagers to select from to provide ideas on how to structure wagering strategies and potential tickets. These suggestions, combined with your own convictions and betting preferences, provide additional useful information to make for a successful experience at the races. 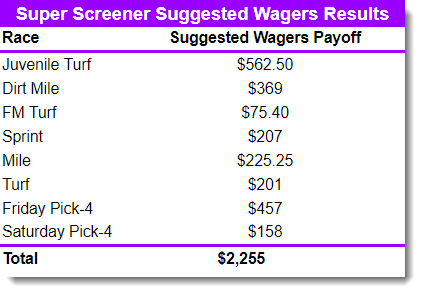 Below is a summary of the return of suggested wagers across the chalky Breeder’s Cup races. In addition to the results just shared, there were some other interesting highlights and key trip notes to share as captured below. 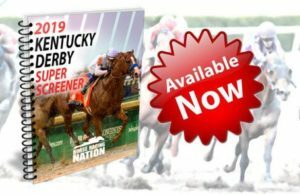 In the Juvenile Fillies Turf, a Super Screener “A” horse in Newspaperofrecord just crushed her foes, submitting the best performance across all Breeders’ Cup races. A Super Screener Top Long Shot pick, East, closed for a distant but solid 2nd at 14-1. Note, Chad Brown has now won 4 of the last 5 editions of this race and Aidan O’Brien has not won this race (or come close) in the past 12 runnings. 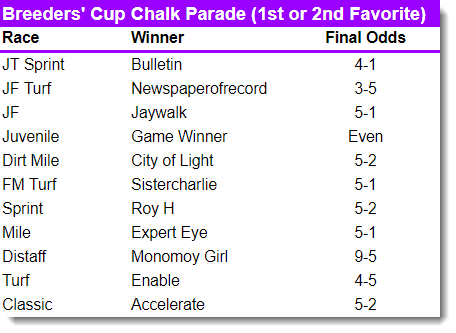 In the Juvenile Fillies, the Super Screener’s pair of “A” horses comprised the Exacta, with Jaywalk winning the race and Restless Rider finishing 2nd. We faded Bellafina due to the lack of any energy being distributed late in her prior races. One of our top conviction horses running in this year’s Breeders’ Cup, Line of Duty, looked hopelessly defeated about mid-stretch in the Juvenile Turf, but then found another gear and gobbled up ground with incredibly long strides to snare the hard-fought win over a very game Uncle Benny. The former foe survived an inquiry/objection which was the right call. Line of Duty’s Morning Line odds were 10-1, which made him a solid Super Screener Top Value play, however, he went off at odds of 7-2 when it was all said and done. The lone “A” horse in the Juvenile, after the scratch of Code of Honor, was Bob Baffert’s Game Winner, who battled a tenacious Knicks Go (40-1) down the entire stretch before finally putting that one away. 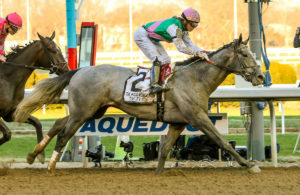 Look for Game Winner to be firmly on the 2019 Kentucky Derby trail. The Super Screener called the Dirt Mile Exacta cold with City of Light capturing the win and Seeking the Soul finishing a strong 2nd at odds of 10-1. Trainer John Sadler was 0 for 43 heading into this year’s Breeders’ Cup. Selcourt finished out of the money in the Filly and Mare Sprint but Catapult did finish a game second in the Mile… the record was now 0 for 45 but redemption and glory finally came when Sadler took down the Classic with a sharp looking Accelerate who came from off the pace to win rather easily. On to the Pegasus World Cup for Accelerate’s final career race. Great to finally see this talented trainer get off the Breeder’s Cup schnied. Did the dirt surface and turf play fair at Churchill Downs or was it biased as some proclaimed? Let’s take a look at the data. There were 7 races run on both the dirt and turf courses. For each race, we looked at the energy distribution profile of the horses that finished 1-2-3-4. As the chart below indicates, both surfaces played pretty darn fair. It “felt” at times that both surfaces played “speedy” but in hind sight those pace winners were just better than all the rest including Bulletin and Newspaperofrecord on the turf and Jaywalk and City of Light on the dirt surfaces. That’s a wrap on this year’s Breeder’s Cup. We hope you had a sensational weekend. Please join us now each week as we analyze the top stakes racing action across the nation. 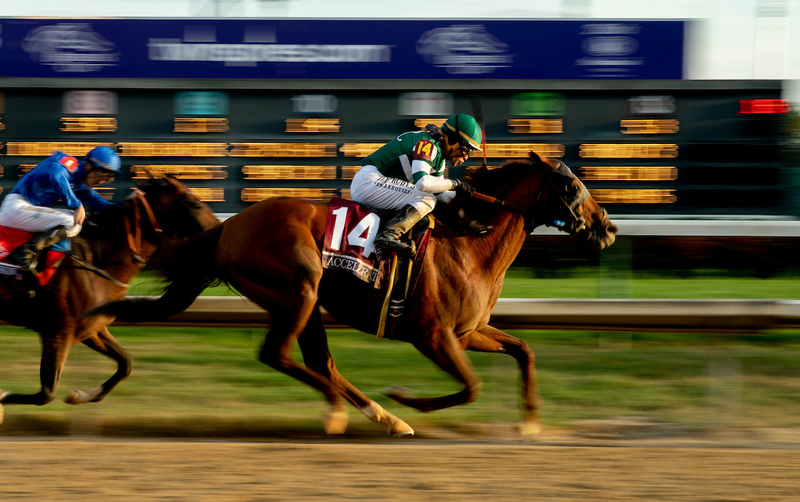 This month we have Del Mar and Churchill Downs offering top graded stakes racing action and other key stakes races from around the US to sink our teeth into. Thanks again for your patronage and loyalty to our Super Screener product. Look for new innovations and improvements in our product in the year ahead. Next Story → Post-Breeders’ Cup Stakes Success – Recap!